When preparing, remember that the more it is cut, the slimier it will become. 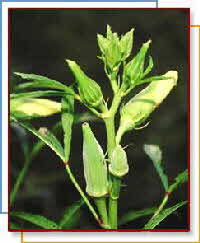 Its various uses allow for okra to be added to many different recipes. Okra is commonly used as a thicken agent in soups and stews because of its sticky core. However, okra may also be steamed, boiled, pickled, sautéed, or stir-fried whole. Okra is a sensitive vegetable and should not be cooked in pans made of iron, copper or brass since the chemical properties turns okra black. Young Versus Mature Okra - What is the difference? Boil or microwave whole until just tender. Dress with lemon juice and ground pepper. Stew with tomatoes. Serve over rice. Add okra to curries or sauté with spices like cumin, coriander, turmeric, or curry powder. If okra is used in a soup, stew or casserole that requires longer cooking, it should be cut up, to exude its juices, and thicken. Okra pods can be sliced, dipped in egg, breaded with corn meal and baked. Sauté okra with corn kernels, onion and sweet peppers for a tasty side dish. Okra has a similar flavor to eggplant and can be used as a substitute in your favorite recipes.